NATO also pledges to support Ukraine's efforts to strengthen its resilience against hybrid threats. "An independent, sovereign and stable Ukraine, firmly committed to democracy and the rule of law is key for Euro-Atlantic security. We stand firm in our support for Ukraine's right to decide its own future and foreign policy course free from outside interference. In light of Ukraine's restated aspirations for NATO membership, we stand by our decisions taken at the Bucharest Summit and subsequent Summits," says the Brussels Summit Declaration issued on July 11 and posted on NATO's website. "We highly value Ukraine's significant contributions to Allied operations, the NATO Response Force, and NATO exercises, and welcome the contribution made by the NATO-Ukraine partnership to providing security and stability in the Euro-Atlantic area and beyond. Those contributions increase the level of interoperability of the Armed Forces of Ukraine with NATO," it said. NATO says it acknowledges Ukraine's interest in the enhanced opportunities within the Partnership Interoperability Initiative. "NATO will consider this in view of the decisions taken at the Wales and the Warsaw Summits. We will continue to work with Ukraine, a longstanding partner of the Alliance, based on the principles and values enshrined in the Charter on a Distinctive Partnership between NATO and Ukraine," the declaration said. 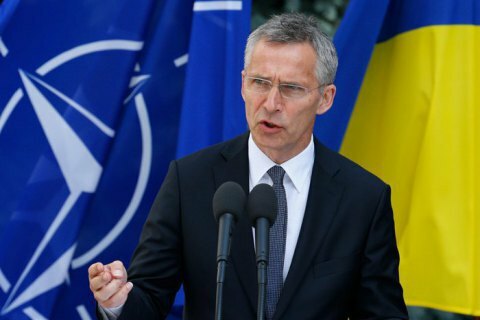 NATO also pledges to support Ukraine's efforts to strengthen its resilience against hybrid threats, including through intensifying activities under the NATO-Ukraine Platform on Countering Hybrid Warfare. "Ukraine should make full use of all instruments available to it under the NATO-Ukraine Commission (NUC), in particular the Annual National Programme, to reach its objective of implementing NATO principles and standards. We remain committed to providing continued support to Ukraine's reform agenda in the security and defence sector, including through the Comprehensive Assistance Package, so that Ukraine can better provide for its own security," the declaration said. NATO also says it welcomes the developing cooperation between NATO and Ukraine on Black Sea security. At the same time, NATO members look forward to further progress in Ukraine's efforts to overcome significant remaining challenges and ensure the full implementation and sustainability of ambitious but necessary reforms, which should be fully in line with Ukraine's international obligations and commitments. "The success of wide-ranging reforms, including combatting corruption and promoting an inclusive electoral process, based on democratic values, respect for human rights, minorities and the rule of law, will be crucial in laying the groundwork for a prosperous and peaceful Ukraine firmly anchored among European democracies committed to common values. We welcome significant reform progress already made, in particular with the recent adoption of the Law on the High Anticorruption Court and the Law on National Security," the document said. With regard to the Law on Education adopted by the Rada in September 2017, Allies urge Ukraine to fully implement the recommendations and conclusions of the Opinion of the Venice Commission. Allies also reiterate their support for the territorial integrity and sovereignty of Ukraine, Georgia, and the Republic of Moldova within their internationally recognised borders. "In accordance with its international commitments, we call on Russia to withdraw the forces it has stationed in all three countries without their consent," the Declaration said. NATO also calls for the full implementation of the Minsk Agreements by all sides, and support the efforts of the Normandy format and the Trilateral Contact Group. "NATO's response is in support of this overall effort, which includes sanctions as decided by the European Union (EU), the G7, and others, to promote a peaceful solution to the conflict and to address Russia's actions. We urge Russia to cease all political, financial, and military support to militant groups and stop intervening militarily in the Donetsk and Luhansk regions and to withdraw troops, equipment, and mercenaries from the territory of Ukraine, and return to the Joint Centre for Control and Coordination," the declaration said. NATO stresses the importance of the safety and full and unhindered access for the Organisation for Security and Cooperation in Europe (OSCE) Special Monitoring Mission, up to and including the Russia-Ukraine border. In addition, NATO strongly condemns Russia's illegal and illegitimate annexation of Crimea, which it does not and will not recognise. "The discrimination against the Crimean Tatars and members of other local communities must end. International monitoring structures must be allowed to carry out their essential work in view of the protection of human rights," it said. Allies also said they are deeply concerned by the use of torture and the transfer of Ukrainian citizens to prisons in Russia.